Latin American political systems have evolved in a major way this century. Most countries in the region are established democracies, with regular and fair votes, a free and investigative media, and independence among the different branches of government. In 2018, Latin America will hold several elections, notably for the presidencies of Colombia (May-June), Mexico (July), and Brazil (October). In addition to the presidential seats, these countries will renew their Congresses and several state governments. The outcome of the presidential races, accompanied by Congressional elections, will help shape economic policies in the region over the next decade. The elections will take place amid a mild upswing across the region. In principle, this should benefit the incumbent parties. Specifically, GDP growth is likely to increase from 1.6% to 2.5% in Colombia, to remain unchanged at slightly over 2% in Mexico, and to accelerate from 1% to 3% in Brazil. Inflationary pressures will probably remain contained in these countries, between 3-4%, close to the targets pursued by the three central banks. Absent major shocks, the Brazilian real and Colombian peso should depreciate modestly, thanks to continuing monetary tightening in the US. The fate of the Mexican Peso seems more uncertain. The currency seems undervalued, and therefore is a candidate for appreciation, unless the outcome of ongoing NAFTA negotiations is too adverse. Against this background, monetary policy is likely to be eased further in Colombia, by some 50-75bps, and Brazil (50bps). It may be tightened some more in Mexico (25-50bps), as its central bank shadows, to some extent, the US Federal Reserve. Important though these elections will be, one should not overestimate their impact. This is because these economies face challenges that limit the scope for any action, and focus the attention and energy of whoever prevails in the respective races. In the case of Colombia, the challenge is to complete the peace process and face the inherent fiscal costs without endangering the country’s important investment grade status. This is a problem evidenced by the recent sovereign rating downgrade. While Colombia’s debt to GDP ratio is not that high compared with some other countries in the region, the primary result has fallen substantially since 2012, as oil-related revenues dwindled. The authorities, irrespective of political affiliation, will need to increase revenues in order to bring the surplus back towards the 1%-of-GDP threshold. Colombia also faces having to cope with a wave of refugees from neighbouring Venezuela. In some scenarios, this might imply a fiscal impact close to 0.5% of GDP. 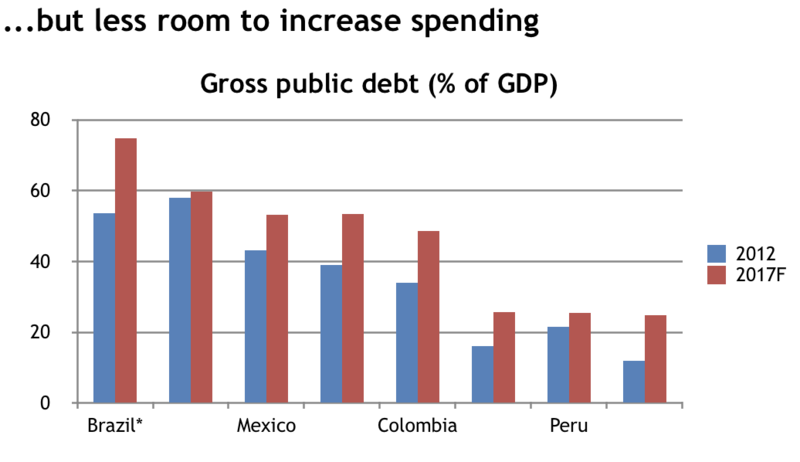 Mexico’s challenges are more connected to the external environment than to fiscal issues, although the latter should not be overlooked (we estimate gross public sector debt rose by 12 percentage points of GDP between 2012 and 2017). The key challenge facing the new administration will be dealing with the aftermath of the NAFTA negotiations. To the extent that a new North American trade arrangement hinders the free flow of goods across the three economies in the region, currencies will need to adjust. The MXN will be the key mechanism by which Mexico copes with the new situation. A weaker peso would have inflationary implications that would impinge on short-term economic policy decisions, especially regarding interest rates. One would hope that the outcome of NAFTA negotiations does not lead Mexico to abandon its trade and outward-looking development strategy, again irrespective of the outcome of the vote. As for Brazil, the fiscal predicament should be the incoming administration’s first priority, irrespective of the election result. Gross public sector debt rose from some 54% of GDP to close to 75% between 2012 and 2017. To stabilize the debt, Brazil needs to implement fiscal adjustment of some 5 percentage points of GDP. With that in mind, the authorities introduced a constitutional ceiling on expenditure growth, to adjust the fiscal stance gradually, but its resilience is as yet unproven. Some factors should help the fiscal accounts in the near-term, such as an economic recovery and the effects of historically low interest rates. However, without further reforms, debt dynamics are likely to worsen again in the near-term, which would prevent any sustainable recovery of economic activity. With trade accounting for just 18% of GDP - one of the lowest ratios within the G20 - and European Union-Mercosur trade negotiations reaching a critical point, incoming Brazilian authorities will need to reflect whether to persist on the country’s longstanding protectionist stance, or to integrate more decisively in global trade. All three countries also face mounting challenges regarding digital inclusion. This is likely to be a key source of competitive advantage (or disadvantage) in this century. Brazil, Colombia, and Mexico stood at 55th, 65th, and 71st in the World Economic Forum’s 2017-18 Global Competitiveness Report, a 137-country ranking. Luxembourg, Switzerland, and Holland came top. The US came 6th. 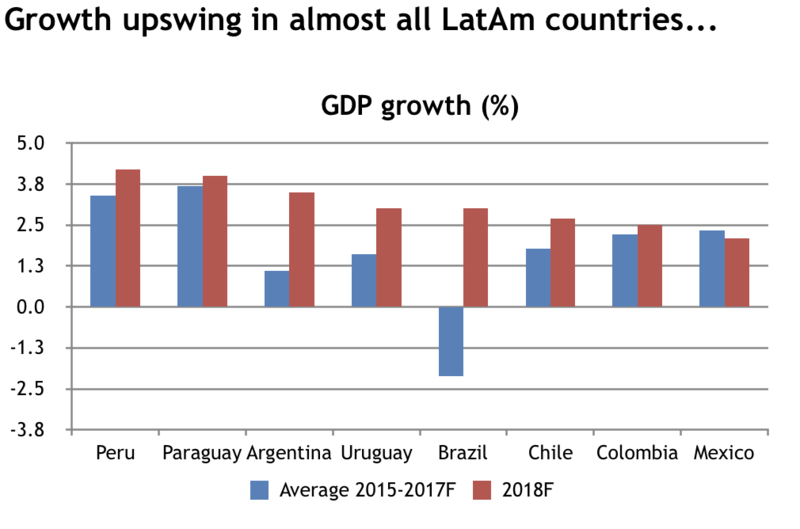 It is hard to envisage Latin American economies gaining ground in competitiveness and per capita income rankings without also gaining ground in their technological readiness. This is a challenge that will be relevant for some time to come, regardless of the outcome of the elections. The 2018 Latam vote marathon may add some volatility to asset prices from time to time. It will certainly concentrate the attention of investors and corporate leaders. But its relevance to long-term issues should not be overestimated. Fiscal, trade and technological challenges remain paramount.